"Am I late to the apocalypse?" An Abandoned Hospital Awakening is, as the name implies, when a character wakes up in an Abandoned Hospital. A combination of several different things in a single convenient package, an abandoned hospital awakening is a popular choice for beginning Horror works, though it shows up in other genres and contexts as well. The hospital used for this has usually been recently abandoned after a disaster of some sort, which helps explain why the character was there in the first place (though not necessarily why they were left behind). Abandoned hospitals are creepy, which sets the tone by itself, but the addition of specific types of Scenery Gorn can ratchet that tension up even further. At the same time, it gives the characters (and the audience) a clue as to why the hospital was abandoned in the first place. Being in a Convenient Coma while the disaster was happening gives them an excuse to be Late to the Tragedy (in some cases finding they have Slept Through the Apocalypse), making them a Naïve Newcomer until they figure things out. If they don't remember why they were in the hospital in the first place, then you've got an Ontological Mystery on your hands in addition to dealing with more immediate problems. Especially popular during a Zombie Apocalypse, for some reason. See Abandoned Hospital for the supertrope. See Waking Up Elsewhere in general. The Walking Dead opens with Rick being shot, then cuts to him awakening some time after the Zombie Apocalypse has begun. 28 Days Later opens this way, with the protagonist coming out of a Convenient Coma twenty-eight days after the Zombie Apocalypse erupted in London. The Descent subverts this when Sarah seems to wake up in an abandoned hospital after her car crash, but she turns out to be hallucinating. The first Resident Evil movie uses this at the end; Alice wakes up in a Raccoon City hospital, with the Zombie Apocalypse well underway outside. The same scene also comprises the beginning of the second movie, Resident Evil: Apocalypse. Featured in The Lost Tales from Camp Blood short, included with the Friday the 13th: The Final Chapter Deluxe Edition. Occurs at the climax of Matchstick Men, when Roy discovers that the hospital room he's been confined in while under arrest isn't a hospital at all, and he wasn't really under arrest. John Wyndham's The Day of the Triffids opens with the protagonist waking up in hospital following eye surgery, his eyes still bandaged. This turns out to be just as well since everyone else has gone blind from looking at weird lights in the sky, and now the population is being picked off by ambulatory, carnivorous plants. This also occurs in the film version of this book. Earth Abides opens with a version of this, with protagonist Ish being bitten by a snake in a remote part of the Sierra Nevada and becoming half-conscious with illness for several days. When he wakes up and gets back to civilisation he finds it... isn't... any more. Warren Hiedler, the Bald Eagle Theriomorph in the Theriomorph Chronicles awakens in the first chapter of Subhuman after being freed by Meredtih Young, the Cougar Theriomorph inside a bloodied operating theater. Inside, he meets his first kill, Praying Mantis Theriomorph after the creature tries to attack him and Meredith. Max the Labrador retriever in The Last Dogs wakes up two weeks after he was put in the kennel at the veterinarian's place. When he wakes up and escapes the kennel, all the humans are gone, and the only company he has are Rocky the dachshund and a pack of angry hungry wolves. David Wong's This Book Is Full Of Spiders has a chapter where David wakes up in a dark room, handcuffed to a hospital bed and completely alone. 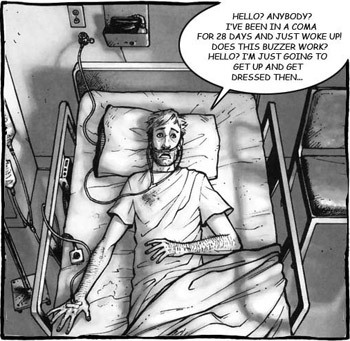 Like the Comic Book above, The Walking Dead begins with a brief prelude in which protagonist Rick Grimes is shot. Shortly after, he awakens to find himself in the hospital, alone. Buffy the Vampire Slayer. In "This Year's Girl", the hospital wing Faith wakes up in after her eight-month Convenient Coma has an ill-maintained look with flickering lights, unpainted walls, and no staff on duty at the time. The beginning of the "Party Rock Anthem" music video. Dead Space 2 has Isaac wake up in a hospital in the Sprawl that isn't quite abandoned, but only because it hasn't finished being overrun by necromorphs yet. Dementium: The Ward has the protagonist wake up in a hospital where everyone else has run away or have been killed, the lights are all out, and the halls are crawling with monsters. The first game begins with the Player Character waking up on the medical deck, now filled with hostile mutants and cyborgs. In the second game, the player also wakes up on the medical/science deck with the ship overrun by The Many. Knights of the Old Republic II: The Sith Lords starts with the player character in the medical ward of a space station that has only two other living beings aboard, one hibernating, the other forgotten. Episode 3 of They Hunger has the player waking up at a hospital after he went through a Zombie Apocalypse; a sweet voice from offscreen says "Wake up, you had a nightmare!" Then the awakening turns out to be a dream, and the player wakes up for real — in a zombie-filled hospital. Afraid of Monsters: David falls unconscious in a hospital bathroom after taking what appears to be a overdose of drugs. After a nightmare sequence, he wakes up in a empty hospital with only hallucinations around him. Nightmare House 2 starts with the protagonist waking up in a padded cell in an abandoned hospital. It only gets worse from there. Variation: the main character of Shin Megami Tensei III: Nocturne awakens to his power in the morgue of an Abandoned Hospital. Why is the hospital abandoned? Because an Apocalypse Cult has taken it over. How does he awaken? By having a demonic insect implanted (through the eye!) by Lucifer. Try counting how many horrors there are here. In Corpse Party 2: Dead Patient, Ayami Itou's story will start this way, with her waking up on an operating table to boot. Metal Gear Solid V: The Phantom Pain: Punished "Venom" Snake awakens from a nine-year coma to find everyone fleeing the hospital he's in as a black ops team storms the building. In FEAR 2: Project Origin, Auburn Memorial Hospital is (mostly) abandoned when Becket awakens after his Harbinger operation. In You Are Empty, the gameplay begins with you awakening in an abandoned hospital, where there are zombie nurses trying to kill you with syringes. The Hero in Midnight Nowhere wake up in a abandoned hospital where everyone else have been killed. Ruby Quest has this, with the twist that we don't know it's supposed to be an hospital until well into the game. In the Family Guy episode "Forget-Me-Not", Peter, Joe, Brian, and Quagmire wake up in an abandoned hospital with no memories at all, and discover they are the last people left on Earth. Through a series of misunderstandings, they come to think Brian is Quagmire's dog and that Peter was the one responsible for wiping out humanity. The whole thing was a virtual reality simulation created by Stewie, who wanted to prove to Brian that the only reason he and Peter are friends is because he is Peter's dog, and the two are just too different in personality to get along otherwise, but Stewie is ultimately proven wrong when the two still become best friends anyway, to the point that Brian even sacrifices himself by Taking the Bullet for Peter when Quagmire and Joe try to kill him in order to avenge the rest of humanity. Stewie also put Lois, Bonnie, and Meg in the same simulation, just to see what would happen. By the end of the episode, they haven't even left the hospital yet, and have apparently just been beating the crap out of each other nonstop for the entire episode. In the Adventure Time episode "No One Can Hear You", Finn wakes up in an abandoned hospital in the Candy Kingdom and soon discovers that the entirety of the kingdom's citizens have mysteriously disappeared.